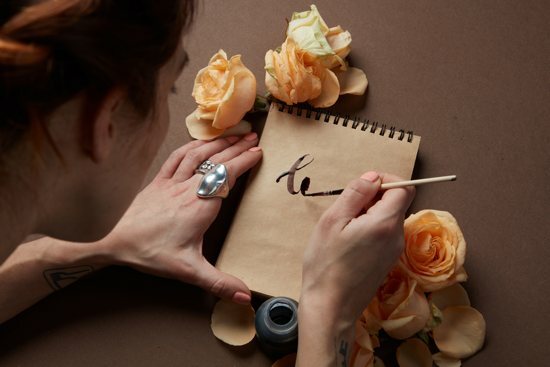 Erica Tighe was 26 when she made the leap: She would set out on her own to be a calligrapher. Full time. In order to pay her $80 0 rent and cellphone bill and $1,000 college-loan payment and also, hopefully, afford some food. She had a sociology degree and lingering burn-out from teaching in Brooklyn, her latest stint. She’d recently moved to Los Angeles, but after a few months of looking for a nonprofit job, she couldn’t find one that would cover her rent and college debt. Several people who had seen Erica’s work online had asked her to make their wedding invitations. She thought maybe that could suffice. She planned to refine her self-taught method, which was eliciting periodic orders for $20 commissions via Etsy. Eventually, a $100 gig came in. She reached out to a fellow Phoenix native who had launched an online ministry for Catholic women called Blessed Is She, offering to make one Instagram quote. The two 20-somethings forged a close partnership on a shoestring budget, granting Erica total creative license to design products — posters, prints, journals, mugs. The first journal sold 700. The latest one sold 9,000. Their hunch proved right: If they poured in the effort and supplied something that was beautiful and original, demand would follow. Today — three years later — Erica makes “a really nice living” running her design business called Be A Heart, which employs two women. She built off the random commissions for website logos and expanded her wheelhouse, learning to paint watercolor, digitize prints and design books. Blessed Is She occupies half her time, allowing her to pursue other projects, including celebrity weddings, calligraphy workshops, a Catholic journaling Bible published last year by Our Sunday Visitor and a lettering book called “Written By Hand,” published last year by Rock Point Press. Barnes & Noble picked it up this spring, and it is being translated into four other languages. Erica invited her 13,000 Instagram followers to work through the book together as a nine-week project using the hashtag “writtenbyhandchallenge.” Participants shared snapshots of their slow-but-steady progress: addressing Christmas cards, making pretty gift tags, working alongside their children. Calligraphy invites you to use your hands, which young adults are itching to do in response to the iPhone era of thumb-tapping, Erica says. It helps explain the resurgence of the antiquated art.